Episode Summary: In many ways, AI and finance are made for each other. Machine learning and other techniques make it easier to identify patterns that might otherwise not be detected by the human eye, and finance is quantitative to begin with, so that it’s hard not to find traction. Financial firms have also invested heavily in AI in the past, and more are starting to tap into the financial applications of machine learning (ML) and deep learning. Artificial intelligence in stock trading certainly isn’t a new phenomena, but access to it’s capabilities has historically been rather limited to large firms. Brief Recognition: Alex Lu has over 17 years of experience in deep learning, artificial intelligence, and big data technology. Before launching Kavout, Alex served as the CTO at one of China’s largest financial information providers; was an Engineering Director at Baidu; a VP of Search Technology at SNDA; a Principal Program Manager at Microsoft; and a senior engineer at Google. He graduated from Tsinghua University, has a Master’s in Computer Science from University of Maryland, and a nMBA from Columbia Business School. 2:50 – How is money management, the trading and ongoing market activity of the currency, meshing with ML? 5:36 – Is that kind of how it works, that what’s going to be cutting edge, what patterns will be coaxed out, will very much be kept secret? 7:49 – It sounds like deep learning and machine learning are on the way to grab an edge – is that safe to say in the dynamics, with hedge funds adopting this? 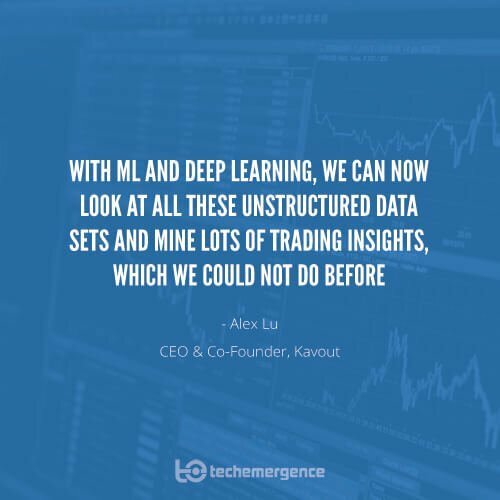 9:54 – You at Kavout – and other financial AI companies – are also working on allowing traders to leverage AI tools, what are some of the applications…that are now available thanks to AI to consumers? 17:44 – What other bits of utility are now available to consumers…that maybe didn’t’ exist on a Schwab computer dashboard screen 5 years ago? 20:45 – You’re talking about a more calibrated (asset selection) approach per person, would this be taking into account their goals? How is that going to calibrate per individual? 1 – Machine and deep learning are allowing financial firms and traders to analyze unstructured data (like financial information on news sites, blogs, across social media, etc.) and reveal patterns not previously identifiable by just human eyes – allowing for an entirely new approach to and ‘accuracy’ in trading decisions. 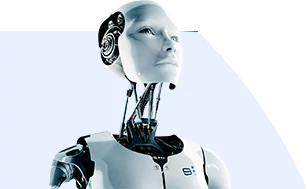 2 – There’s a need for robo-advisors that will better take into account and integrate individuals’ behavior patterns alongside their stated financial objectives, resulting in more adaptive and targeted investments. At Emerj, our role is to help business leaders stay ahead of the applications and implications of AI that will impact their bottom line. Tens of thousands of managers, founders and executive all over the world listen to our “AI in Industry” podcast on iTunes each week. If you’d like to stay ahead of the curve on AI in finance, consider subscribing. Episode summary: In this episode we talk to Lior Tasman who is the CEO of PredictiveBid, an Israeli-based predictive advertising optimization start-up. The team focuses on applying AI to some of the bigger issues in programmatic advertising to help draw out more ROI from ads. We discuss some of the challenges of programmatic advertising and what the future of programmatic advertising may look like from an advertiser’s perspective.